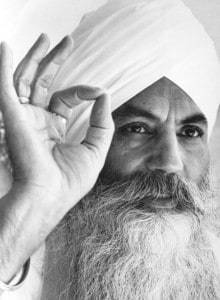 Kundalini yoga is a profound holistic healing system brought to the west by Yogi Bhajan. KY includes yoga kriyas, mantra chanting, breathwork, bhandas, meditation, and yogic lifestyle practices. Postures range from sitting to quite vigorous movement. Depending on the kriya, or yoga set, taught, the classes can be easy to very challenging. Mantra and breathwork are core practices in KY. Mantra Chanting is considered to be a sacred part of the “Nad”, or universal sound current. Mantras are basically keys to activate different parts of the psyche and nervous system through the thousands of nerves on the roof of the mouth. (It’s kind of like Morse code for the soul!) They also give the mind something to focus on instead of our many distracting thoughts. Many of the excercises ride the breath to help move energy throughout the body. Many types of breathwork are practiced in kundalini yoga. Some are meditative, some are invigorating. Yogi Bhajan also prescribed hundreds of meditations, some with various combinations of mantra, bhanda, or body/energy locks, and breathwork. Practicing a meditation for 40 days is a frequently prescribed practice to build discipline in one’s life and effect profound shifts! There are also various lifestyle practices in kundalini yoga that may be used to widen the effects of this scientific yogic system even further such as daily sadhana, daily practice and prayer, and ishnan, early morning cold showers with oil massage. Jaya teaches private and group classes in Kundalini yoga. Private sessions are tailored to your needs. Jaya teaches group yoga classes at events and in retreat settings and can bring her large gong for an amazing deep relaxation at the end of class. This is a wonderful way to Align the group energy and prepare participants for an amazing event. Combined with sound healing and shamanic/hypnotic guided meditations, these “Kundalini Sound Activation” workshops can last 1-3 hours. Please contact Jaya to book her for your next event or retreat. You can gift your participants with an amazing experience to awaken their highest self and effect major shifts! Jaya took teacher training with Sat Santokh in 2004-2005 and again withShiv Charan Singh, Harijiwan, and Guru Meher in 2009 at Shuniaa. This was a life transforming experience for her. Her Sikh Spiritual name of Sat Kriya Kaur, means the Princess of True Action.